So how many of y’all still haven’t started your Christmas shopping yet?? Waiting until the very last minute?? 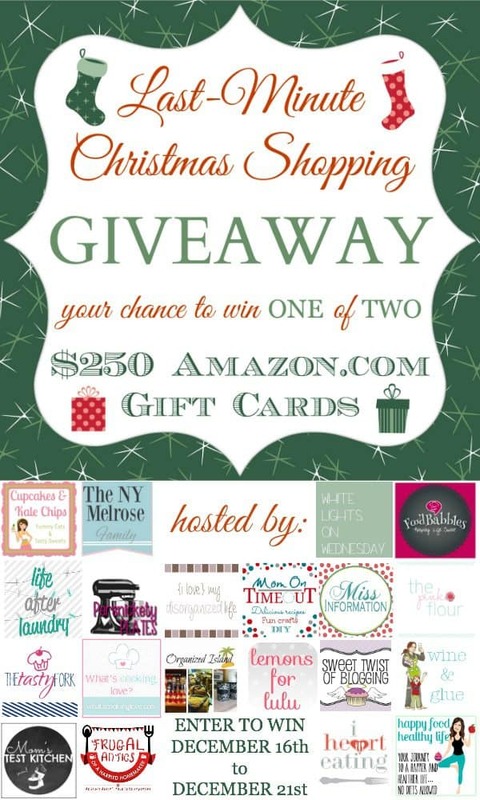 Well, some of my friends and I are here to help you out with our Last-Minute Christmas Shopping Giveaway and your chance to win one of TWO $250 Amazon.com Gift Cards. All you have to do is enter the #giveaway through the Rafflecopter link below and tell us what gifts are left on your list that you would buy with this gift card. Once you comment, you will have 60 other chances to enter. The giveaway runs from December 16-21, 2013 and two winners will be chosen and notified on December 22, 2013. the winners will then have 48 hours to respond, or another winner will be chosen. Please read the complete Terms & Conditions as this giveaway is only valid for U.S residents only (Sorry, rules of the gift card company prohibit us from offering this outside of the U.S.). I still have stocking stuffers left to buy & a couple more things for my husband. A motorcycle jacket for my husband. Had to cancel my credit card yesterday and so might get myself something. Will take 3 or 4 days for my CC to get here. I’d have to buy some preschool games, like Ants in the Pants, and dress-up clothes for my two boys. I’d love to buy a soda stream & ebooks for gifts if I won! I need to buy for my husband and dad! Men are hard to buy for! I need to get my mom something and she is so difficult to buy for! I still need to get my husband a couple smaller gifts and my dad something. But I don’t know what yet for either. It would go towards buying my little brother an awesome christmas gift. He’s 18 now and I feel as the big sister he deserves something great!